The protection which is installed on an industrial power system is likely to be subjected to more difficult conditions than the protection on any other kind of power system. Starting with the many simple devices which are employed and covering the whole area of industrial power system protection, this book aims to help achieve a thorough understanding of the protection necessary. Vital aspects such as the modern cartridge fuse, types of relays, and the role of the current transformer are covered and the widely used inverse definite-minimum time overcurrent relay, the theory of the Merz-Price protection system and the development of the high-impedance relay system are critically examined. This new edition has come about in response to the dramatic change from the use of electro-magnetic relays to electronic and micro-processor relays which figure in practically all new installations. Therefore, although the theory and usage are the same, the application can be much improved owing to the increased range and accuracy and the added facilities provided with the modern relays. This book reflects the change and explains the technical advantages. Electrical engineers with responsibility for the design of power systems; Technicians who deal with the testing of relays; Electricians. Simple protection devices; Relays; Current and voltage transformers for protection; Fault calculations; Timegraded overcurrent protection; Unit protection; Feeder protection; Motor protection; Generator protection; Control circuits; Testing; Index. 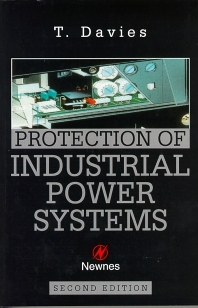 "The book covers the most important aspects of industrial system protection."